We’d love your help. Let us know what’s wrong with this preview of The Black Dawg by Louis McIntosh. The process of writing and illustrating The Black Dawg poem has helped us both to recognise, understand and explain what we go through when we are depressed. Louis says “I am motivated by a passionate need to articulate depression and diffuse the stigma around it and I hope that fellow sufferers will recognise their symptoms and realise they are not alone. I also hope that The process of writing and illustrating The Black Dawg poem has helped us both to recognise, understand and explain what we go through when we are depressed. Louis says “I am motivated by a passionate need to articulate depression and diffuse the stigma around it and I hope that fellow sufferers will recognise their symptoms and realise they are not alone. I also hope that reading The Black Dawg may help friends and family to better understand the dark journey that their loved ones take unwillingly. The vibrant, evocative artwork enhances and dramatises the rhythmic and potent prose. To ask other readers questions about The Black Dawg, please sign up. The beginning of the book speaks deeply about both the contributors’ depression. Through Louis McIntosh’s meaningful poems, I can feel his pain, frustration, and desperation. The illustrations, by Kathryn Hockey, perfectly mirror the feelings in each poem. 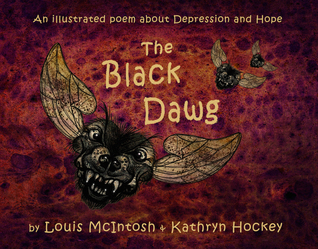 During the darker poems, the illustrations appear surreal and twisted “The Black Dawg: An Illustrated Poem About Depression and Hope”, by Louis McIntosh and Kathryn Hockey reflects the moods and symptoms of one who struggles with depression. The beginning of the book speaks deeply about both the contributors’ depression. Through Louis McIntosh’s meaningful poems, I can feel his pain, frustration, and desperation. The illustrations, by Kathryn Hockey, perfectly mirror the feelings in each poem. During the darker poems, the illustrations appear surreal and twisted. At the end of the book, when the poems change to a much lighter side, with messages of hope, the artwork are calming and reflect a new-found peace. I truly haven’t come across this unique style of illustrations before and these combined with the poetry really compliment each other. In my opinion, “The Black Dawg: An Illustrated Poem About Depression and Hope”, by Louis McIntosh and Kathryn Hockey is like playing a mental health “I Spy” game by which I was thoroughly engaged in finding the connections between the verses and illustrations.